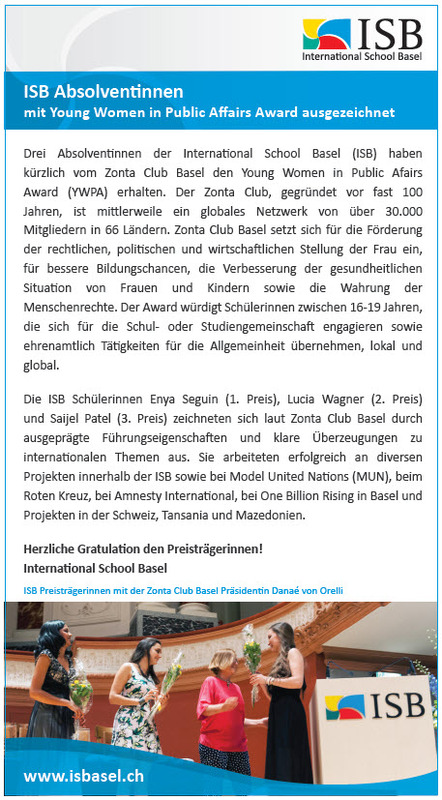 Three students of the International School of Basel (ISB) have recently been the recipients of an award for Young Women in Public Affairs (YWPA), presented by the Zonta Club, Basel. The award is open to female students aged 16-19, based in the Basel region, and was created to encourage young women to be active in public life, politics and non-profit organisations. The award recognises leadership skills and acknowledges both international mindedness and active participation in local issues. ISB students Enya Seguin, Lucia Wagner and Saijel Patel, were awarded first, second and third prizes at an award ceremony held at the Hotel Les Trois Rois, Basel, on the 2 June. The young women impressed the Zonta judges with their understanding of international affairs and commitment to local issues. They were able to demonstrate an active involvement in societies and organisations that promote social awareness on both a local and international scale. The success of ISB students, both this year and in several previous YWPA award ceremonies, may be attributable to how the School actively encourages students to demonstrate international mindedness, both through specific academic programmes of study and by encouraging its students to travel to other countries to understand better the lives of other individuals and societies. The Zonta Club, founded almost 100 years ago, is now a global network of over 30 000 professionals and executives in 66 countries. Its aims are to improve the legal, political and economic status of women worldwide, targeting access to education and healthcare, through projects, awards and scholarships.